nd instability of color perception. 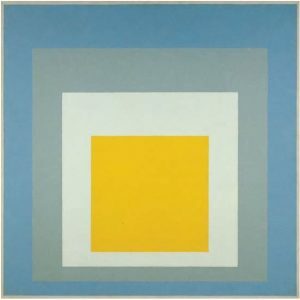 Albers varied the saturation (a color’s brightness or dullness) and tonality (lightness or darkness) of each square in each painting. As a result, the sizes of the squares from painting to painting appear to vary (although they remain the same), and the sensations emanating from the paintings range from clashing dissonance to delicate serenity. In this way Albers proved “we see colors almost never unrelated to each other.”2 Artists’ comments on their own works are often invaluable to art historians. plastic, clay, or metal sculptors select. three-dimensional spatial world on a two-dimensional surface. canvas, 4′ 10″ × 6′ 4″. Perspective is one of the most important pictorial devices for organizing forms in space. Throughout history, artists have used various types of perspective to create an illusion of depth or space on a two-dimensional surface. The French painter clauDe lorrain (1600–1682) employed several perspective devices in Embarkation of the Queen of Sheba (fig. 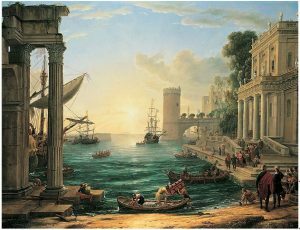 2), a painting of a biblical episode set in a 17th-century European harbor with a Roman ruin in the left foreground. For example, the figures and boats on the shoreline are much larger than those in the distance. decreasing an object’s size makes it appear farther away from the viewer. Also, the top and bottom of the port building at the painting’s right side are not parallel horizontal lines, as they are in a real building. Instead, the lines converge beyond the structure, leading the viewer’s eye toward the hazy, indistinct sun on the horizon. These perspective devices—the reduction of figure size, the convergence of diagonal lines, and the blurring of distant forms—have been familiar features of Western art since the ancient Greeks. But it is important to note at the outset that all kinds of perspective are only pictorial conventions, even when one or more types of perspective may be so common in a given culture that people accept them as “natural” or as “true” means of representing the natural world. 4′ 111–8 ″ × 12′ 7–8 ″. Museum of Fine Arts, Boston (Fenollosa-Weld Collection). In Waves at Matsushima (fig. 3), a Japanese seascape painting on a six-part folding screen, oGata Korin (1658– 1716) ignored these Western perspective conventions. A Western viewer might interpret the left half of Korin’s composition as depicting the distant horizon, as in Claude’s painting, but the sky is a flat, unnatural gold, and in five of the six sections of the composition, waves fill the full height of the screen. The rocky outcroppings decrease in size with distance, but all are in sharp focus, and there are no shadows. The Japanese artist was less concerned with locating the boulders and waves in space than with composing shapes on a surface, playing the water’s swelling curves against the jagged contours of the rocks. Neither the French nor the Japanese painting can be said to project “correctly” what viewers “in fact” see. One painting is not a “better” picture of the world than the other. The European and Asian artists simply approached the problem of picture-making differently.